Ugur Kaynak* Ph.D. and Simon Butterworth** Ph.D.
Tsunamis are ocean and sea waves that are generated by a variety of geological processes such as earthquakes or submarine landslides. The term tidal wave is more frequently used for such a wave, although they have no connection with the tides. After a generating impulse, a train of simple progressive oscillatory waves spreads across the ocean or sea in ever-widening circles. In deep water, the wavelengths of these Long Sea Waves (destined to become the tidal wave at the coast) are enormous and the gradients slight; in fact the passage of a tsunami at this point is likely to go completely unnoticed by ships. However, as the tsunami approaches shallow water, the wave can be pushed up to great heights, potentially leading to catastrophic damage at the coast. Tsunamis are most frequently observed in the Pacific Ocean, which is surrounded by the volcanoes that make up the so called Ring of Fire. Perhaps it should also be called the Ring of Earthquakes, as these have requently caused tremendous damage throughout the region. It is Japan, however, that has probably suffered the most damage from large waves. Perhaps the most destructive tsunami in history occurred in 1703 at Awa in Japan; it killed more than 10,000 people. Indeed, the actual word "tsunami" is Japanese and it translates as 'harbour wave', a very appropriate name. The Long Sea Waves, hardly noticeable in deep water, reduce their speed while approaching the coast and harbours and consequently (dramatically) increase their height. There are two reasons for this increase. Firstly, as the depth of the sea floor decreases as the wave approaches the shore the wave is squashed from underneath. Secondly, in bays and harbours, the wave is squashed from the sides, also resulting in an increase in height. The Sea of Marmara is situated in the north-western part of Turkey, a very active seismic area. The Sea is connected through the Bosporus in the northeast with the Black Sea and through the Dardanelles in the southwest with the Aegean Sea. Despite its small area of just 11,350 square km, its average depth is about 494 m, reaching a maximum of 1,355 m in the centre. The coast is heavily populated and Turkey's largest city, Istanbul, is positioned on the northern shore at the entrance to the Bosporus. The tectonic of the region is dominated by the North Anatolian Fault Zone, which stretches from the Aegean in the west, right across Turkey to the east. Significantly, this fault zone traverses the Sea of Marmara. Historically, the North Anatolian Fault Zone has been the epicentre of many very large earthquakes. In 1999 there were two large earthquakes located in the area just to the east of the Sea of Marmara. The first was occurred on August 17th 1999 in the East Marmara and the second on November 12th 1999 near the city of Duzce. A large earthquake is expected in the Sea of Marmara in the coming years and there has been much speculation about the possibility of an associated tsunami. important to remember that a submarine earthquake is not necessarily the cause of a tsunami. Moreover, a dangerous type of tsunami can be generated by the eruption of an undersea volcano which may not be associated with a large magnitude earthquake. Further, earthquakes that are caused by normal faults may cause less amounts of damage on the coast but can cause large waves. Tsunamis are functionally different from wind-generated waves. The main differences between tsunamis and wind-generated waves are given in Table 1.
km/h, whereas Long Sea Waves can travel at speeds of up to 750 to 800 km/h, depended on the depth of sea, that is, as fast as a jumbo jet. This means those 10 to 12 hours after a Hawaiian earthquake, any Long Sea Wave generated could reach Japan and Alaska. Although Long Sea Waves would not be noticed in the open ocean, they get much higher and slower as they approach the coast, transforming them into the harbour wave, the "tsunami". Long Sea Waves generally spread out across the sea surface in a circular or sometimes elliptical pattern depending on the local bathymetry and the geometry of the generation. source. The simplest case would be of undersea subsidence, whereby a piece of the sea floor suddenly drops vertically. An immediate drop in the sea level over a large area occurs as deep water rushes into this new depression on the sea floor. 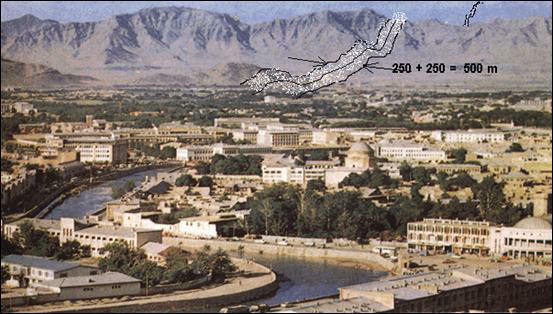 This rushing in of new water from all directions would cause the sea level directly above the subsidence site to rise. The surrounding surface water is now raised above the general level and would then fall down into the surface depression. In this way, a vertical oscillation of the sea surface is generated. Other generation systems have different details but the essence of a vertical oscillation is the same. Figure 1 shows the profile of the sea some time after the oscillations begin. The timing of this profile would depend on specific local conditions (the timings for the Pacific Ocean and the Sea of Marmara would be very different). Figure-1. The Hydrodynamic representation of a tsunami. In contrast to the large scale water movements that occur during the generation of a tsunami any mass transfer is minimal in wind generated waves. Essentially, in a normal water wave, the water molecules exhibit elliptical motion. However, some long duration winds are capable of mass transport. For example, during the autumn and winter in the Marmara region, a long term wind, the Lodos, blows from the southwest and the sea levels on the northern shore can rise by up to 0.5m. ii. That they are the result of multiple faulting of a crushed zone in the geological past with its subsequent weakening being exploited by the sea. A third idea, currently in preparation, is that the Sea of Marmara might represent a preserved part of the northern flank of the Tethys Ocean. The evidence for this is tentative and is based on ophiolite remains and other geological features of the region. Whatever the origins , Seismic surveys show hundreds of small active graben like structures with symmetric normal faults in the sea floor of Marmara. This shows that the area is undergoing tensional stress. Subsidence of these structures is possible, and this may cause an associated tsunami. Historical records show that there have been at least eleven (three) tsunamis in the Sea of Marmara but these cannot be definitely associated with a definite subsidence event. The newer study about Marmara tsunamis announced that 30 tsunamis reported in Marmara coasts at least. Consequently, it can only be said that a subsidence-induced tsunami is not a common occurrence. Figure 2 shows the sequence of events involved in the generation of a tsunami in a series of snapshot pictures. It shows how the sea will recede from the coastal shelf before the actual Long Sea Wave is completely generated. The first drop in the sea level occurs above the subsidence and then spreads sideways. In picture 2, the coastal waters have started to drop, potentially dropping to zero depth in later pictures. As the water falls to the centre from all directions in picture 5 it collides so forcing an up welling above the central zone. This is the beginnings of the vertical oscillation that generates the tsunami. In picture 6, the Long Sea Wave has been generated and in picture 7, the harbour wave has formed at the coast. In the final picture, the harbour wave breaks. In the Sea of Marmara, the emptying of the highly elongated Gulf of Izmit in the east will occur approximately 10 minutes before the arrival of the tsunami. Significantly, any tsunamis in the Sea of Marmara must reach the coast before completing two (one) period. The size of any tsunami associated with a landslide is proportional to the size of the landslide itself. Induced deep water currents are also related in this way. Landslides occur where the sea floor is not well cemented and the topography is rough. In the Sea of Marmara there are several sites where there is potential for landslides. The thickness of the material involved would be of the order of 125 to 150m, and the landslide would have a width of about 1000m and a height of about 1200m. 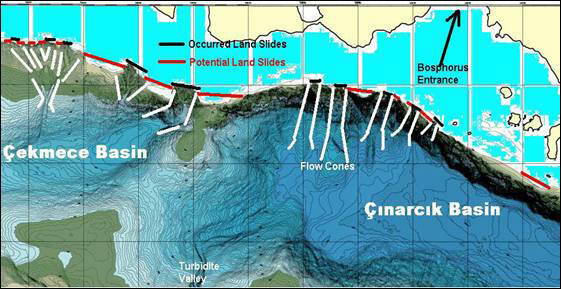 These are average figures potential landslides in the Sea of Marmara could involve several billion tonnes of material. A landslide may be associated with an earthquake in two ways: Either the earthquake triggers the landslide or, conversely, the landslide causes a seismic disturbance. 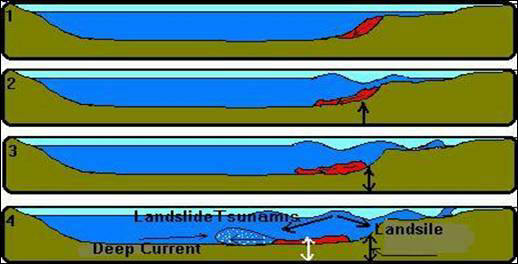 Figure 3 shows the development of a tsunami generated by a landslide in a series of snapshot pictures. In picture 1, the red mass is to become the body of the landslide. In picture 2, the mass has just begun to slide, a body of perhaps a billion tonnes moves allowing the sea floor to rebound elastically upward. Picture 3 shows the short term vertical oscillations that result in the sea floor. In picture 4, the white arrows show how the sea floor is first pushed downward as the mass passes over the sea floor and a secondary vertical oscillation results. There are now two vertical oscillators working with large periods, sometimes out of phase and sometimes in phase, and consequently producing a very complex seismic signature. After a landslide, you can hear the arrival of the p-wave then feel a low frequency sv-wave lasting approximately 1.5 wavelengths. The Sea of Marmara consists of four deep basins, the Çinarcik Basin to the south and southeast of the city of Istanbul, the smaller one Çekmece Basin to the south and southwest of the city of Istanbul, the Tekirdag basin in the west and the Eregli Basin in the middle. Figure 4 shows a map of the Marmara directly to the south of the Bosphorus. These three basins have been the centres of many earthquakes. Often, the tsunami associated with a landslide has proved more dangerous to the region than the associated earthquake. The contour patterns in Figure 4 reveal several large scale and distinct rectilinear structures. These show the positions of large scale landslides. These structures are about 1000m wide, 1200m high and 150m thick. This implies a total mass of more than 500 million tonnes of material was involved in these landslides. In 1963 an earthquake occurred on the northern flank of the Çinarcik Basin close to Istanbul and produced a seismic signature with some unusual characteristics. The most important was that, although the duration of the shaking was longer than 1 minute, there was almost no damage in the region; in fact, only one person was reported as being killed, by falling masonry. Secondly, the seismic wave was almost purely ground-roll and thirdly, we believe that there was no release of any elastic energy from the hypocentre. It seems likely that a landslide may have caused the unusual earthquake observed in 1963 in the Çinarcik Basin. Moreover, this map helps us to understand some similarities between the 1963 Çinarcik Basin earthquake and the large Istanbul earthquake of 1894. In the 1894 earthquake the shaking was also of long duration (according to some sources it lasted up to 2 minutes) and caused widespread psychological trauma. It was a very significant earthquake for the city but the death toll was modest, being about 300. During the 1963 Çinarcik Basin earthquake, despite there being a breakwater near the old city of Istanbul, the coastal road was inundated by sea waves that were over 3m high, could these have been small scale tsunamis? Tsunamis were also not reported during the Istanbul earthquake of 1894 nevertheless, the 1894 earthquake is one of the more well studied historical earthquakes. After this earthquake, the Sultan invited an engineer from Greece to produce a report and, although this was in pre-instrumental times, a seismic intensity map was produced. This map allows us to estimate the position of the epicentre with great confidence. It is likely that an earthquake on the Island Fault of the North Anatolain Fault Zone was the trigger for a landslide in the Çinarcik Basin in 1894. From maps of the Marmara region supplied by Suroit (and reproduced later in Figure 10) it is possible to see the places where landslides have occurred or are likely to occur on the sea cliff. It is even possible to identify which inhabited areas are at risk of a tsunami by looking at the pattern of contours. When the hot ashes, gases, volcanic bombs and other materials associated with a volcanic eruption explode upwards from an undersea crater , they will accelerate the water above vertically. This ejection of material may be associated with the eruption of a new volcano or a pre-existing plugged one. Moreover, the nature of the eruption may result in a sequence of vertical oscillations in the water above. These results in tsunamis that can be very dangerous and can produce 30m high waves in coastal bays. 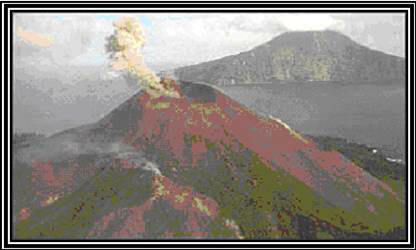 A terrifying and famous example occurred in 1883 near Java at Krakatoa (figure 5). The main eruption was heard thousands of kilometres away and a series of tsunamis killed 36,000 people in the nearby coastal towns of Java and Sumatra. The tsunamis were recorded as far away as Hawaii and South America. All of the life on the Krakatoa island group was buried under a thick layer of sterile ash, and re-establishment of plant and animal life did not begin for five years. Ash was spread world-wide by the jet stream. According to some European records, ash in the atmosphere required oil lamps to be lit during the day for several weeks. During the next decade, European winters were severe. Fortunately the Sea of Marmara is not an active volcanic area. Clearly tectonic movements of the sea floor can lead directly to tsunamis. Figure-6. The Probable N-S Cross Section of the Marmara Sea Region. The NAFZ (North Anatolian Fault Zone) is a strike slip fault which cuts the Lithosphere. 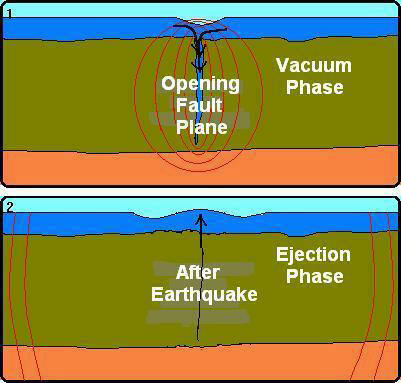 It can cause low intensity tsunamis by the opening and closing of the fault plane. The Basin Wall Normal Faults can generate the Sea Floor Land slides and Tsunamis. The other Normal Faults on the Marmara floor can generate some low intensity depression type settlements and Tsunamis. After an earthquake, earth-scientists often gain some new understanding of the processes involved. One of the authors recently watched a television report from northern Afghanistan in which a local leader was being interviewed. An earthquake quickly brought the normal programme to an end but the camera revealed a corridor of dust in the background which was crossing the mountains where a strike slip fault was in motion, releasing the strain stored in this deformation zone (figure 7). The fault opened about 1 meter bilaterally releasing strain on both sides, a figure which is unexpectedly large. After opening and the strain was released the horizontal oscillations began. Moreover, it would normally have been expected that the fault would undergo deformation release over a length of about 250m, but it was possible to estimate from the pine trees on the mountainside that the actual figure was more than double this. At the sea floor the scale of movement has clear implications for the generation of tsunamis. During conversations with local people after the Adana-Ceyhan Earthquake of 27 June 1998 (magnitude 6.3) in southern Turkey it became apparent that during this event the fault also opened up much more than expected. The Ceyhan River, that crossed the fault line prior to the earthquake, flowed into the opening fault line for a period of about 1 minute and briefly dried up beyond the fault line. This implies that a large volume of water could easily be contained within the opening fault. Interviews conducted after the larger East Marmara Earthquake (17 August 1999) suggest that this fault must also have opened up much more than might have been expected. One witness, interviewed at length, was sitting on his balcony on the hillside above Hereke on the northern shore of the Bay of Izmit during the earthquake. He observed a ship disappearing and called to his family, believing it had sunk. It then appeared again and then “sank” again. He then recalls feeling the earthquake as he was trying to put his glass down on the table. The interview suggests that there was about three or four seconds between him seeing the ship “sink” and feeling the earthquake. His house is about 100m above the sea, and the area slopes directly toward the place where the ship was observed. We estimate from his observations that the ship dropped about 15m when it appeared to sink. During this earthquake, the Golcuk area on the southern shore opposite Hereke was flooded by tsunamis several hundred metres inland. During the same East Marmara Earthquake, a naval officer was fishing on a small boat with his son. His first thought was of a nuclear strike, as he observed lights (electrostatic) above the city. He then reports his boat being between two “walls of water” and being “lifted and dropped” several times. He also found himself displaced 2 km during the earthquake, ending up in the newly submerged Golcuk Park. When an earthquake occurs just in the bending area of the both of subducted and obducted crust, it’s magnitude probably will reach great values. The compression of the bottom of the bending crust and the dilatation of the ceiling of the bending crust will produce some earthquakes associated with the main sinking crust shock. Naturally the absence of some of them will reduce the total magnitude. 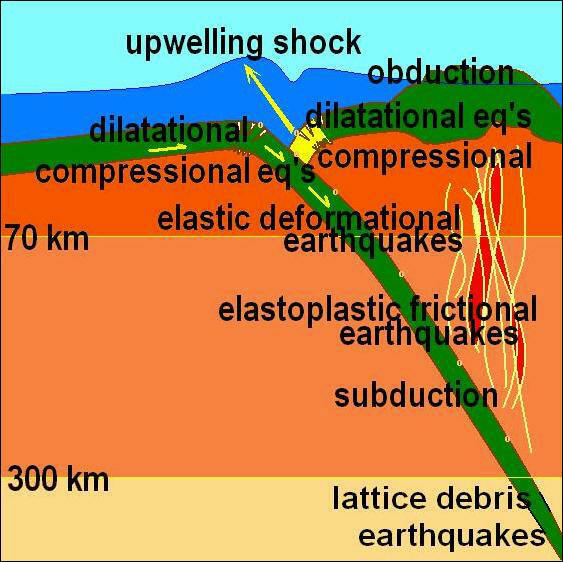 But neither they occur in the elastic deformation zone nor in the lattice debris zone, even they have a big magnitude, they couldn’t feel as a destructive earthquake on surface because they have not any secondary (shear) wave emmition and also have a big distance from surface. On the other hand when the friction rezistance of the two cold occean flor (crust) defeated on the friction plane, by the freedom of the obducted crust, the occean water will be upwelled above in the deepness of the trench. (the yellow part of the Figure) In this circumstances, it is not necessary to have any landslides on the flanks of the trench. The machanism of the last M=9 earthquake triggered Sumatra Tsunami is obductional hit obove type. Other causes of tsunamis include the collapse of ice shelves and asteroid strikes on the oceans. Unlike the tsunamis described in the previous sections, these are created at the sea surface rather like wind generated waves. However, unlike with wind generated waves they involve a large scale mass transfer of water. In recent years, Earth scientists have been regularly writing articles in the Turkish popular press concerning the risks associated with the expected large earthquake in the Sea of Marmara. The tsunami risk associated with this earthquake has been a leading topic. The previous sections discussed tsunamis in general, now a risk assessment for the Sea of Marmara will be developed. Importantly, compared to tsunamis in the Pacific Ocean, the ones in the Sea of Marmara will be relatively small. One interesting point is related to the physical size of the Sea of Marmara. Measurements of Long Sea Waves have demonstrated that they travel in the open Ocean at about 800 km/h. 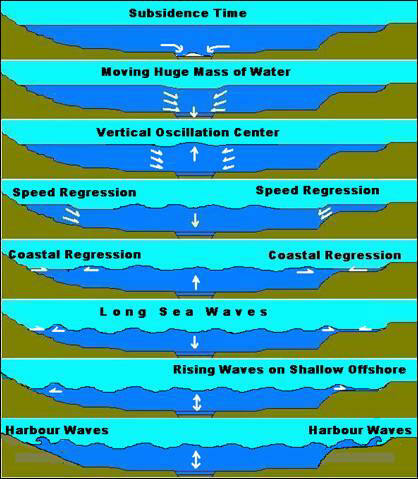 In the shallower Marmara sea as the long sea wave speed reduce, functionally the wave height will increase. This means that a Long Sea Wave generated in the Sea of Marmara would travel the length of the sea, from east to west, but excluding the Izmit Bay, in about 30 minutes. The reason why we exclude the Izmit Bay is that the wave speed will be very significantly reduced in this shallow area. Historical records of previous tsunamis suggest that the wave could be slowed by as much as half. Since the wavelength of the Long Sea Waves is actually larger than the Sea of Marmara itself, the harbour wave would arrive to the north and south shores before a single period of the Long Sea Waves has been completed. 1. There is no ocean trench in the Sea of Marmara. This means that landslides on the scale of 8 - 10 billion tonnes (as occur in Major trenches) are unlikely. 2. Although the Sea of Marmara as a whole is a subsiding area, individual symmetric fault systems and associated graben structures are small and densely packed. This means that in the event of a graben collapse, only a small mass of water would rush in. 3. In the Sea of Marmara there are no active or dormant volcanic systems. 4. In the Sea of Marmara, there are strike slip fault systems which could open and close again during an earthquake. This would first cause water to rush in to the opening fault before then forcing it back out again. This activity can produce low amplitude harbour waves. For example, in 1999 the towns of Gölcuk and Degirmendere were inundated in this way. Landslide generated Long Sea Waves tend to have larger amplitudes than those generated by strike-slip faulting. 5. Significantly, there is an amplitude reducing factor for this region. The width of the Sea of Marmara is such that it will only allow one wavelength of a Long Sea Wave to fit within it; moreover, its length will only allow for two wavelengths to fit. This means that the Long Sea Wave will reach the coast and become a harbour wave before any resonance effects can occur. A larger body of water would allow for several oscillations and allow the wave to find its natural frequency. Although an earthquake will occur in the Sea of Marmara during the coming years, it is not certain that there will be a tsunami associated with it. Very importantly, the public announcement of tsunami risk has ethical considerations. Local economies can suffer greatly. House prices and rents in some coastal areas of Istanbul were very badly affected after the 1999 earthquakes and are only now recovering. Moreover, other areas perceived as being safe from risk saw property prices shoot up. Although the public is often not directly interested in scientific research and publications, some information is necessary if they are to take appropriate decisions. Bathymetric maps of the Sea of Marmara are available and are highly detailed. It is possible to see the fault lines and their vertical extension, the areas where landslides are possible and the approximate masses of the solid materials potentially involved. The bathymetric contours provide realistic clues about all of these. In Figure 10 the areas that have suffered actual landslides and the areas with the potential for future landslides are shown. To the south of the Central Basin an Çinarcik Basin there is clear evidence of several huge landslides that have occurred on the shelf. It seems likely that large harbour waves must once have strongly affected the northern shore of the western Sea of Marmara. It is also reasonable to assume that Marmara Island would have acted as a barrier for the southern shore of the Sea, which consequently would not have been as greatly affected. Tsunamis are reflected and refracted by near shore bottom topography and coastal configurations just like any other sea waves. Consequently, their effects can vary greatly from place to place. Calculations suggest that any tsunamis in the Sea of Marmara will only rarely exceed 6 metres in height, at least outside of the Izmit Bay area. Excluding this bay, the areas at greatest risk are the densely populated areas of Buyukçekmece to the west of Istanbul, the Bay of Gemlik on the southern shore, the mouth the Bosphorus in Istanbul, and the entrance to the Dardanelles. Moreover, because the northern and southern flanks of the Sea of Marmara are very shallow compared to the very deep central area, any “harbour wave” effect resulting from a Long Sea Wave will be exaggerated even in the absence of a harbour or estuary. The Izmit Bay should be considered separately because of its geometry; the bay is relatively narrow (6 km or so) and it is very long (80 km). The Izmit Bay is, perhaps, the area most at risk from a tsunami, since a landslide on the western flank of the Çinarcik Basin would trigger a wave aimed directly into its mouth. The western side of the Çinarcik Basin is less steeply inclined than the other parts of the basin but the material is softer and less stable. Moreover, the gas emanating from all along the fault will especially reduce the stability of this type of material. In 1958, the ferry “Üsküdar” was travelling across the Izmit Bay when a powerful wind blew up from the west. Large waves sank the ship with the loss of over 350 lives. A landslide on the western flank of the Çinarcik Basin could produce waves 7 to 8 metres high at the eastern end of the Izmit Bay, inundating both the rail and motorway routes on both the northern and southern shores. In some historical documents, it has been reported that during tsunami episodes the sea in the bay regressed greatly, even allowing people to collect lobsters, shellfish and fish from the exposed sea bed. Unfortunately, 8 or 10 minutes after this regression (the various documents differ) the sea returned, drowning many. In short, tsunami risk in the Sea of Marmara (Figure 11)is real and is one of the many factors that need to be considered in the light of the earthquake threat to the region. However, our study suggests that the Sea of Marmara should not be considered as an important “Tsunami Sea” but rather as a “Fault Sea”. PINAR, N. and LAHN, E., (1952), Türkiye Depremleri Izahli Katalogu, Imar ve Iskân Bakanligi, Imar Reisligi yayin no.36, seri.6. J.T.WILSON, (1963), Evidence from Island on the Spreading of the Ocean Floor., Nature, 197, pp.536-538. ERGIN, K., GÜÇLÜ, U. ve UZ, Z., (1967), Türkiye ve Civarinin Deprem Katalogu, ITÜ.,Maden Fakültesi Yayini. ERGIN, K., GÜÇLÜ, U. ve AKSOY, G., (1971), Türkiye ve Dolaylarinin Deprem Katalogu, ITÜ., Maden Fakültesi, Arz Fizigi Enstitüsü Yayini. Hüseyin SOYSAL, Selçuk SIPAHIOGLU, Demir KOLÇAK ve Yildiz ALTINOK, (1981), Türkiye ve Çevresinin Tarihsel Deprem Katalogu, TÜBITAK Proje No.TBAG.341, Istanbul. Nezihi CANITEZ (Editör), (1983), Levha tektonigi (Ders Notlari), TUBITAK ITÜ. Yaz Okulu Yayini. ALPAR, B., (1999). Underwater signatures of the Kocaeli Earthquake (August 17th 1999), Turkish Journal of Marine Sciences 5: 111-130. ALTINOK, Y., ALPAR, B., ERSOY, S., YALÇINER, A.C., (1999), Tsunami generation of the Kocaeli Earthquake (August 17th 1999) in the Izmit Bay: coastal observations, bathymetry and seismic data, Turkish J. Marine Sciences, 5, 130-149. AMBRASEYS, N.N., (1960), The seismic sea wave on July 9, 1956, in the Greek Archipelago, J.Geoph. Res, 65, 1257-1265. AMBRASEYS, N.N., (1962), Data for the investigation of the seismic sea-waves in the Eastern Mediterranean, Bull. Seism.Soc. Am., 52, 895-913. AMBRASEYS, N.N., FINKEL, C.F. (1991), Long term seismicity of Istanbul and of the Marmara Sea region, Terra Nova, 3, 527-539. AMBRASEYS, N.N., FINKEL, C., (1995), The Seismicity of Turkey and Adjacent Areas. A Historical Review, 1500-1800, Eren Yayincilik, Istanbul. ÇAGATAY, M.N., GÖRÜR, N., ALGAN, O., EASTOE, C., TCHAPALYGA, A., ONGAN, D., KUHL, T., KUSÇU, I., (2000). Late glacial-Holocene palaeoceanography of the Sea of Marmara: timing of connections with the Mediterranean and Black Seas, Marine Geology, 167: 191-206. HECK, N.H., (1947), List of seismic sea waves, Bull. Seism. Soc. Am., 37, 269-286. HUBERT-FERRARI, A., BARKA, A., JACQUES, E., NALBANT, S.S., MEYER, B., ARMIJO, R., (2000), Seismic hazard in the Marmara Sea region following the 17 August 1999 Izmit Earthquake, Letters to Nature, 269-273. LE PICHONX., TAYMAZ, T., SENGÖR, A.M.C. (1999), Büyük Marmara fayi: Niçin, nerede ve ne olabilir. Cumhuriyet, Bilim Teknik, Deprem Özel Sayisi, 20 Kasim 1999, 661, pp. 8-11. OKAY, A.I., DEMIRBAG, E., KURT, H., OKAY, N., KUSÇU, I. (1999), An active deep marine strike-slip basin along the North Anatolian fault in Turkey, Tectonics, 18: 129-148. ÖZÇIÇEK, B., (1996-1997), 18 Eylül 1963 Dogu Marmara Depreminin Etüdü, Jeofizik, Cilt 1,69-78. PAPADOPULOS, G.A., CHALKIS, B.J., (1984), Tsunamis observed in Greece and the surrounding area from antiquity to the present times, Marine Geology, 56, 309-317. PARARAS-CARAYANNIS, G., (1992), The Tsunami Generated from the Eruption of the Volcano of Santorin in the Bronze Age, Natural Hazards, 5: 115-123. PARSONS, T., TODO, S., STEIN, R., BARKA, A., DIETERICH., (2000), Heightened odds of large earthquakes near Istanbul; An interaction-based probability calculation, Science, 288: 661-665. STEIN, R.S., BARKA, A.A., DIETERICH, J.H., (1996), Progressive failure on the North Anatolian fault since 1939 earthquake stress triggering, Geophysical J. Int., 128: 594-604. SENGÖR, A.M.C., DEMIRBAG, E., TÜYSÜZ, O., KURT, H., GÖRÜR, N., KUSCU, I., (1999), Izmit Körfezinin deniz altinda kalan resminin jeolojik yapisi, Cumhuriyet Bilim Teknik, 14 Aralik 1999, pp.17-18. YALÇINER, A.C., SYNOLAKIS, C., BORRERO, J., ALTINOK, Y., WATTS, P., IMAMURA, F., KURAN, U., ERSOY, S., KANOGLU, U., TINTI, S., (1999), Tsunami generation in Izmit Bay by 1999 Izmit Earthquake, Proc. of the International Conference on Kocaeli Earthquake, ITÜ, Dec. 2-5, 1999 Istanbul, pp. 217-221.